Since 2003, the authorities have sought to weaken and undermine independent civil society in Azerbaijan. In January 2019, several Azerbaijani activists declared a hunger strike calling for the release of jailed anti-corruption blogger Mehman Huseynov and other people they consider political prisoners. In January 2019, several Azerbaijani activists declared a hunger strike calling for the release of jailed anti-corruption blogger Mehman Huseynov and other people they consider political prisoners. Mehman Huseynov is an Azerbaijani human rights defender and journalist. He is the editor-in-chief of the Sancaq TV, a socio-political magazine, which is active on Facebook, YouTube and Instagram. Similarly, he is also the Chairman of the Institute for Reporters’ Freedom and Safety (IRFS), a human rights organisation that campaigns for freedom of expression and freedom of information. As previously covered on the CIVICUS Monitor, Huseynov was detained and later convicted in 2017 to two years in prison on defamation charges after alleging that police beat him. In late December 2018, two months before the end of his imprisonment, two further charges were presented against Huseynov. The authorities accused him of allegedly assaulting a prison officer. Many claim the new charges are a fabrication by the Azeri authorities designed to extend Huseynov’s detention. In response, the new charges prompted him to start a hunger strike, along with other political prisoners. "[T]he immediate and unconditional release of Mehman Huseynov and urges the Azerbaijani authorities to drop all new charges against him; expresses concern over his health for which the authorities must provide all the necessary professional medical assistance and allow regular access for his family and privileged legal counsel." "The actions taken against Mehman Huseynov appear to be politically motivated and strongly linked to his legitimate work raising awareness of human rights and issues related to corruption. These actions have led directly to his current severe condition, as with seemingly no access to justice and arbitrary restriction of his freedom, Mehman Huseynov saw no other option than to go on hunger strike on 26 December 2018." Following the outrage, on 22nd January 2019, the Prosecutor-General's Office announced it was dropping the charges against Huseynov. On 4th January 2019, a Court in Baku issued a decision regarding the case of activists that took part on a protest to denounce the new criminal charges against the Azeri blogger Mehman Huseynov. The Court found the activists guilty under Article 513.2 (violation of the rules for holding rallies, pickets and demonstrations) of the Code of Administrative Offenses. Afghan Sadigov, website editor for Azel.tv, was convicted to 22 days in prison. The other participants, Canal 13 correspondent Nurlan Gahramanov, the Popular Front Party of Azerbaijan (PFPA) activists Elimkhan Agayev and Sakhavat Nabiyev, were also convicted to 21 days. Other participants, such as blogger Fatima Movlamly and the PFPA activist Parvin Abysheva were given fines. In a separate development, on 19th January 2019, thousands of demonstrators took to the streets in the capital Baku to demand the release of anti-corruption blogger Mehman Huseynov, who is currently in prison as explained in the Expression section. "[P]ut an end to smear and slander campaigning against civil society activists and to respect the commitments taken by the government before international organisations, in particular the commitments under the Eastern Partnership Programme." Despite the constitution’s express recognition of the need to establish a civil society, in practice human rights activists, journalists and critics of the government in Azerbaijan face targeted and undue restrictions on their work. Despite the constitution’s express recognition of the need to establish a civil society, in practice human rights activists, journalists and critics of the government in Azerbaijan face targeted and undue restrictions on their work. Recent legal changes seek to extinguish independent civil society in Azerbaijan by impeding access to domestic and foreign funding, giving the government discretionary power to dissolve associations, impose financial penalties or freeze the assets of CSOs. In 2014 alone, over 50 organisations had their bank accounts suspended, and as of 2015, 80 political prisoners languish behind bars Even lawyers defending outspoken civil society activists face criminal sanctions, travel bans or disbarment. In November 2015, a UN Special Rapporteur stated categorically that ‘freedom of assembly is in a crisis in Azerbaijan. In November 2015, a UN Special Rapporteur stated categorically that ‘freedom of assembly is in a crisis in Azerbaijan. His comments were based on the almost total criminalisation of participation in peaceful protests since 2011, and recent legal changes which impose harsh fines on protestors. Police regularly prevent, break up or disperse protestors using violence and intimidation. For example, in August 2015, police quickly dispersed a crowd after people took to the streets of Mingechevir in protest at the death of a man in police custody. 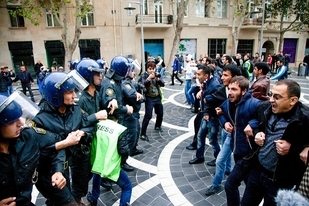 Repressive tactics against protestors now also include a complete ban on protests in the capital Baku, imprisonment of protestors and particular targeting of pro-democracy demonstrations. People’s right to freely express themselves, and particularly the ability of civil society activists, journalists and pro-democracy groups to advance their causes, is severely curtailed. People’s right to freely express themselves, and particularly the ability of civil society activists, journalists and pro-democracy groups to advance their causes, is severely curtailed. The danger of attacks, detentions and extra judicial killings of journalists and bloggers is real, with 8 journalists remaining imprisoned in Azerbaijan in 2015. At least five journalists and bloggers have been murdered in Azerbaijan since 1992. The government of Azerbaijan has systematically executed its crackdown on news outlets to seriously constrain independent media in the country. Legislation introduced in 2014 sought to stop foreign media funding, leading to an exodus of journalists, bloggers and outspoken activists, with many now operating from overseas.